Wait, which chickadee is she again? 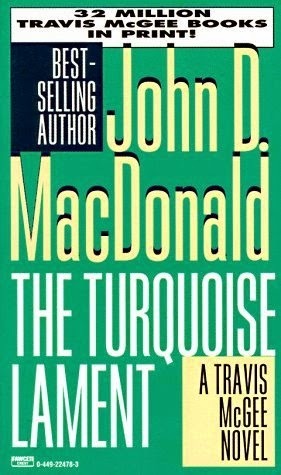 To give John D. MacDonald his due, his entertaining and quixotic detective fictions have certainly kept my attention for longer than more challenging and potentially rewarding works from chaps like David Foster Wallace and John Barth, for whom I need to build up a tolerance in the intervals between books which is depleted during the reading so that I might have the courage to finish them in a less than diabolically lengthy period and so that their influence on my own writing has the opportunity to wane and diminish. I am a terrible, terrible mimic of other peoples' styles. MacDonald provides a salve to a disquieted mind, something chewy but not strongly flavoured - no, sorry that's not quite accurate. Travis McGee has a very distinct flavour, a cherrywood smoked, Plymouth ginned, sun lotioned and salt tanged flavour. What is missing is the active involvement of the reader, making it all so much fun and fluff, pretty pictures with primary colours. It's easy just to read and to not think. It's probably the same reason I like a beer every couple of minutes, from time to time. Thinking is HARD. So tilting at this particular windmill is particularly redundant. Yes, as a main character Travis is flawed; he's knowingly sexist, requires some one-on-one sessions with the diversity trainers at Bahia Mar, and could stop vacillating between perceived nobility and gratuitous violence for five minutes without dying of the shame. The novels are showing their age, now that we're into an age of spying from the comfort of one's smart phone, with some old-fashioned phone-book sleuthing and whatnot, and frankly, all of the female characters, apart from the one with the woman who was... no, sorry I was mistaken, they all really blend into one vacuous and offensive stereotype, a damsel in need of rescuing, despite not wanting to and exercising her own cute little feet stamping independence before Trav either slugs 'er or beds 'er. But they're not all bad, or rather, they're all not bad. That's a feat in and of itself quite remarkable, a consistency which is hard to achieve and difficult to deride. The fact that I can't for the life of me remember the who what where why of this one* is neither here nor there. Trav's flaws provide friction, drama, and plot devices. His blind spots are where the baddies live, and if he doesn't get knocked out at least once a novel then, frankly, what's the point? His hirsute side-kick Meyer, the supposed brains of the operation, provides a nice little counterpoint to hulking brutality and low cunning, and there are numerous titillating if nauseating moments of amorousness. All in all, this is pulp at it's least worst, and if you can't do anything else with your life but do the reading without the thinking, this would certainly kill some of that endless time of yours. *No, wait, it's all coming back to me. There was a boat, a bad guy, a girl, and - sorry, I could actually be talking about any single one of the series. I tried, really I did.